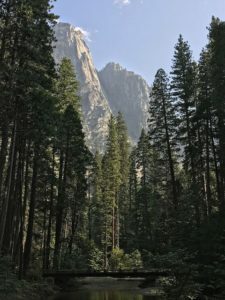 In August 2017, I completed my first Sierra Club Service Trip, where I spent 7 wonderful days at Yosemite National Park working on various restoration projects. The trip was an eye opener for me in many ways: I learned a great deal about my capacity to serve on a work team, I came face to face with my limited stamina and got reacquainted with an old rotator cuff injury. On the other hand, I got to enjoy living and sharing meals with 15 Sierra Club members who were more experienced in this than me, and best of all, I gained access to the behind the scenes workings of Yosemite, one of our best loved and most visited national parks. For six nights, I camped at a pristine campground shaded by 50’ Yellow Pines alongside the cool and clear Merced River. The view was like nowhere I have ever been before with the towering monoliths of Sentinel Peak and El Capitan on either side of us. When we weren’t working, I was gazing at or swimming in the mountain-fed river. I also took walks to the various scenic points in the park including Lower Yosemite Falls and Yosemite Village. Sleeping in a tent was not new to me, but admittedly, it had been a few years since I had camped for more than two nights in the open air. What I discovered was that I don’t sleep well in the “great outdoors.” Every twig that snapped, every snore that was uttered, and every zipper that was opened on a nearby tent was heard by me. This was probably due to my fear of bears making an appearance — or it could have been my hyper vigilant state, in general. On the whole, this trip was well organized by Charlie, our outgoing and always cheery Group Leader, with four days of service work and a day off in the middle of the week for us to explore the many trails that intersect the Park. On my day off I chose to hike to Sentinel Dome and Taft Point off Glacier Point Road. Joining me was a perky and energetic 79-year old woman and another who was 72. Both were in great shape and were excellent companions for the hikes. We started the hike to the 8,127’ Sentinel Dome first, which was just 1.2 miles from the parking lot off Glacier Point Road. The weather was beautiful although smoke from the two active fires there obscured some of the views. From the top of the polished granite dome, I was able to see Vernal Fall (317’) and Nevada Fall (594’) which were flowing dramatically in full force. 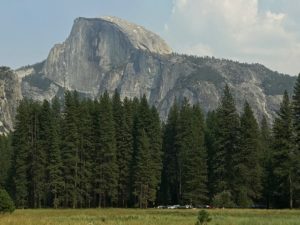 There were also astounding views of the monoliths in Yosemite Valley with nice views of El Capitan and a side shot of Half Dome, the most recognized and photographed mountain in the Park. From Sentinel Dome, it was another 1.2 miles to Taft Point which ended at Inspiration Point, a sheer cliff that dropped about 1,000’ to the Valley below. Taft Point is at 7,100’ elevation (as compared to the 4,000’ Yosemite Valley floor). While we were there, we got to see a group of young men who were straddling a thick cord tied to two points, about 40’ apart, above the abyss. As we watched them, the young man slipped and hung upside down by his hands while suspended in his harness. It was a frightening sight and one that I didn’t wish to watch for long. Both hikes offered wide views of dramatic scenery and a good workout with all the ups and downs on the trails. For our four days of service work, we started each day at 9 a.m. and worked until 3 p.m. duffing and fluffing, weeding and seeding, and shoveling and breaking up hard dirt surfaces for new plants to be set in the ground. Each day started with a visit from Park Service personnel who instructed us on our mission for the day. 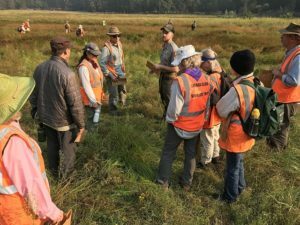 This included a background explanation of what the Park was trying to accomplish, whether it was for recreating a wetlands environment for birds and water mammals, removing invasive plants from the meadows, collecting seeds from native plants for replanting, or removing duff (mulch) from a Native American historical site. Each task was within our capability and we had plenty of time for rest and water breaks when they were needed. On the first day of service, we got to meet “Bill,” a Miwok/Paiute elder who oversees the sweat lodge at Camp 4, the site where his ancestors lived and where he grew up. He told us about the old days and what it was like living in Yosemite for four seasons and how his grandmother made traditional baskets that were sold there. While we were working on shoveling the duff into the back of the truck, we got to watch the felling of a 70’ tree that had to be removed due to damage from beetles. Seeing the tree fall in the forest was amazing. The thud from the weight of the tree shook the ground and reverberated off the mountains! Back at our campsite, we enjoyed freshly-made meals by our excellent cook, Laurel, who prepared three meals daily for each of our days there. I can tell you from my own experience, no one left hungry and each meal was nutritious and healthy. As each of us enjoyed our meals, we also got a chance to help assist in their preparation and in the clean up that followed, overseen by our “Sanitation Engineer” Group Trainee, Doug. At night, we sat around a roaring campfire and listened to informative presentations on the history of Yosemite by the Acting Supervisor of the Park, who explained the Park’s policies and various environmental concerns. We learned about photographer Ansel Adams and how he helped put Yosemite on the map and we heard a proposal by one of our group members to create an integrated Hut-to-Hut system for America, similar to what they have in Europe and Scandinavia. We also got schooled, by our group leader, on Sierra Club policies, procedures, facts and figures, as it related to Yosemite.